I sometimes think that people visiting Reston may think condos and apartments are the only living options. Certainly in the Reston Town Center area where more condos are being built all the time it seems that way. 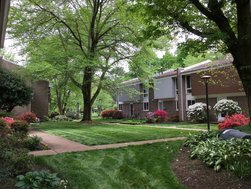 But many long-time Reston residents associate Reston living with townhouses. That makes sense with close to a 140 separate townhouse clusters in Reston. Each has its own personality too. Often when I’m working with new clients who aren’t from the area, they’ve never considered living in a townhouse. It’s a condo or single-family home. They perceive townhomes as dark and small with little privacy from neighbors. I just laugh a little. Because when they visit some of the townhome communities around here, they quickly change their minds. Our townhome clusters are wildly varied from the comfortable and modest to over-the-top luxurious. Many are on lakes or a golf course. All have beautiful, well-kept common areas. What’s best for new homebuyers is that Reston townhomes offer a wide range of housing options for almost every price point. That means neighborhoods are often a combination of young families, singles, or couples who have downsized. It’s a wonderful, eclectic mix. And for busy professionals, there is the bonus of a lovely neighborhood that you don’t have to care for — your cluster maintains the common property. If you’ve never considered townhome living because you’re worried about the size, the light or living in such close proximity, may I invite you to tour some Reston townhomes. In my opinion, we do it better than any other town. From the first communities built in Reston, Waterview and Hickory Clusters, to West Market built in 1998, Reston has perfected townhome living.